Pipes tone Music Days is slated for Memorial Day weekend again this year. At 7pm on Saturday, May 28, the Pipestone Orchestra, under the direction of Tara Kaiyala Weaver, will perform works by Wagner, Verdi, and Strauss, and local cellist Pam Hunt will play the first movement of the Haydn concerto in C Major. Also on the program are some exciting pieces from the scores of Star Trek and Return of the Jedi. Another highlight of this event is an opportunity to hear the winner of the Christine Cherrington Merit Award. Each year the recipient of this award is given the honor of performing as a soloist with the orchestra. The orchestra continues to recruit players, so please don’t hesitate to contact Cascadia if you would like to join the ranks! On Sunday, May 29 at 1pm, Pipestone students will share the results of their hard work and dedication to their chosen instruments. Piano, guitar, violin, viola and cello are all instruments you will hear. 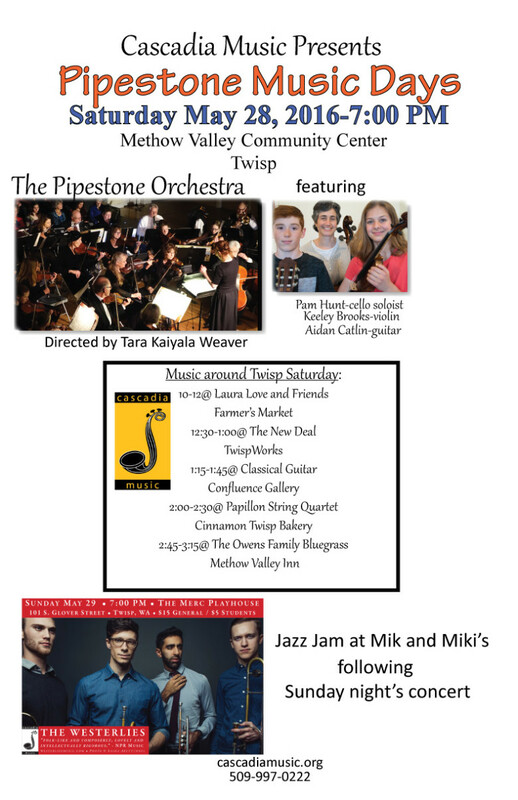 Cascadia will also organize the following line up ranging from Bluegrass to Jazz to String Quartets on Saturday, May 28th throughout Twisp.